In the late 1940's Lindapter revolutionised the concept of 'blind' fixing, or where access is available, with the development of the Lindibolt. Some time later, following the introduction and wide acceptance of hollow section steelwork, the range was expanded to include the Hollo-Bolt. 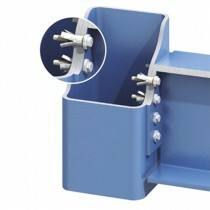 The Hollo-Bolt is ideal for use on any steel structure eliminating the need for unsightly welding or strapping, installation is simple and quick requiring only the type of hand tools commonly available on site.